One of Toronto’s oldest and best steakhouses, Barberian’s has been grilling since 1959.
: Tradition runs deep at this classic steakhouse, opened by the Barberian family in 1959. 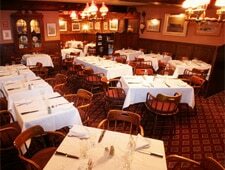 Its dining rooms are adorned with Canadian artwork, specifically paintings by the famed Group of Seven. The waiters, career pros all, have many decades on the floor. While heavy on the meat, the menu also includes a notable seafood selection, like salmon steak and Nova Scotia lobster. Start with the smoked Atlantic salmon, pâté maison, or lobster cocktail. Fresh daily fish, barbecue ribs and lamb are available, but steaks are the attraction --- from an eight-ounce filet mignon to the Châteaubriand for two. Desserts range from the frozen chocolate éclair to indulgent, hot apple beignets. Wines are plentiful, with over 2,000 labels on hand in the cellar. The after-ten theatre menu is quite popular, which offers fondue, a Grand Marnier soufflé for two, and baked Alaska.